I took Rene out for a 20-mile shakedown spin today–it’s been over a year since the last time I rode this bike. Fop chariots are very convenient for late fall, winter, and early spring because there’s enough space for changes of clothes and lots of food. I have a few 200-300 mile rides planned for this fall, and there are few places to stop at 4 am in the middle of the Catskills for a snack. The Berthoud lunchbox and generator-powered lighting are very convenient for all-night rides. Although I feel slower because I can’t feel the road through the 38-mm tires, I seem to be at least as fast, if not a little faster, on this bike than on my narrow-tired bikes. This entry was posted in bicycles and tagged Catskills Cycling Bicycle Routes on September 28, 2014 by John Ferguson. I’m not sure why, but that beautiful bike just says Catskills to me. Wow that is quite a steed. @Spencer, if I download that app can I follow you like Strava does? That’s a brilliant looking ride. Christian, yes I think you can get the Ride with GPS app and see others rides, I only just started using this app so I could follow the exploits of John and John as they ride the Catskills. Ok I just got it installed, will mess around and try and find you guys. Thanks! @Spencer If you log into your account via the web you can look at other users rides and copy them into your routes. Very cool. It’s hard to tell from the photograph whether that Swallow’s broken in, but wouldn’t you prefer something more like a B17 for rides of 200-300 miles? I haven’t done brevets in a couple of years but even in my heyday I’d’ve passed on the Swallow for rides of that length. 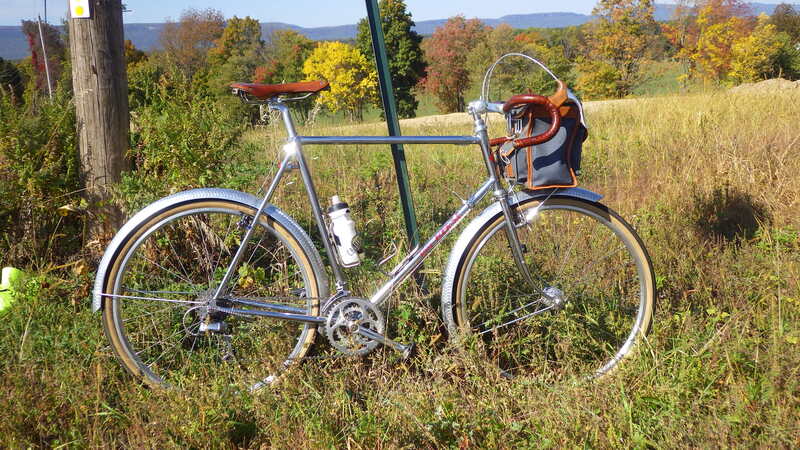 Otherwise, though, I can hardly imagine a more beautiful or appropriate bike. Jan Heine would be proud. No. I much prefer the Swallow. Different saddles for different asses. I see you have a decaleur attached to the bag. Do you find that essential / useful with the front bag? I’m about to add a small rack and rando bag to my commuter and wondering if the decaleur is really necessary since there are straps under the bag to connect it to the rack. I can’t imagine how it would work without a decaleur unless you are going to use a very small bag. I should mention though that some bags come with straps that go around your handlebars…if you want to do that then a decaleur is unnecessary. Also note that a decaleur makes strapping the bottom of the bag to the rack unnecessary.